A rare photograph of Irish revolutionaries in America around 1919. Location unknown but possibly somewhere in Los Angeles. 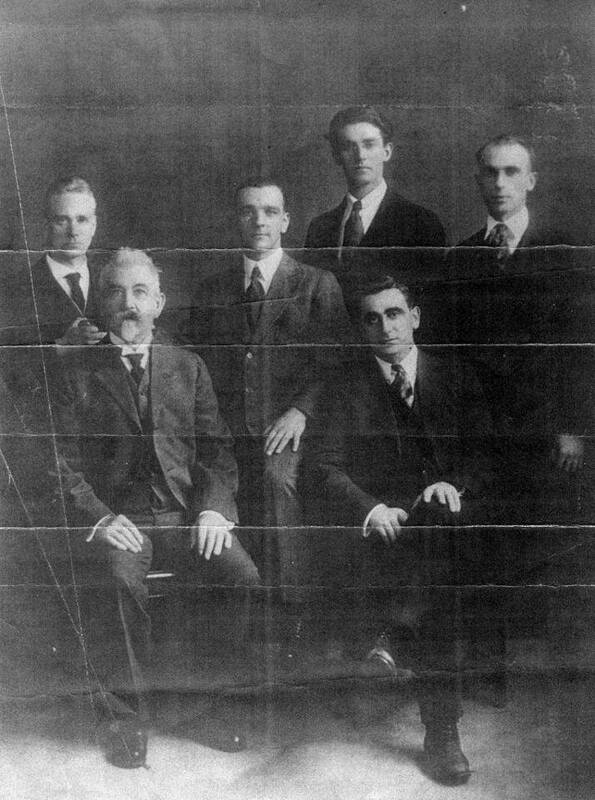 Back row (L-R): Liam Mellows, Tommy O’Connor, Paddy Fleming and George (or Arthur) Murray . Front row: John ‘Dad’ Murray on the left and on the right is his son Peter Murray. The Murray family were very prominent Irish-American supporters of the Irish fight against the British. They lived in California around the Los Angeles area. Many Irish Revolutionaries spent time at the Murray household in California, Sean T. O’Kelly, Eamon de Valera, Tommy O’Connor, Harry Boland, Liam and Sarah Mellows, Paddy Fleming and Eamon Martin. Fianna Chief Eamon Martin stayed with the Murrays after 1916 to recuperate from wounds received during the Easter Rising. A very successful republican club called the ‘Peter Murray’ Irish club was in existence in LA up until the 1950’s. In his later years John moved back and retired to Ireland and lived in Howth, Dublin. This entry was posted on Saturday, May 30th, 2015 at 12:19 am	and posted in Fianna articles archives. You can follow any responses to this entry through the RSS 2.0 feed. The two other men in the photo are, from left to right, Arthur and George Murray. Arthur and George were sons of John and brothers to Peter. Arthur Murray was my grandfather and he is not in this particular photograph. George is on the right in the back row. John and Peter are seated in the front. Tommy O’Connor, the IRB’s transatlantic courier is the man in the centre (3rd from left). Here’s a small piece we did on him and his brother (www.storiesfrom1916.com/1916-easter-rising/tommy-and-johnny). We have a 20 min mini-doc just about finished that will tell his story. Watch this space! Man dead center is my grandfather, Tommy O’Connor ! He was an IRB courier for several years. I have lots of info about his work with Liam Mellows, Harry Boland, Sean T O’Kelly, Eamon de Valera, the Murrays and others. Would love you to get in touch Ellen. Do you have a contact email address? I am interested in the Murray Family. There is correspondence with the Murray family (mainly with Peter) in the John Byrne Collection at San Jose State University. It also includes a 1968 interview with Arthur and George Murray by Mary Condon. Oh my, I live in San Jose and Peter Murray is my great grand uncle. I will have to check this out.